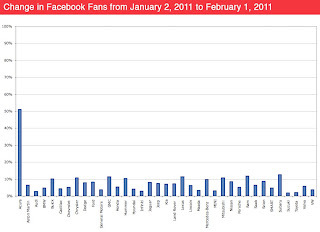 There wasn’t a lot of growth in January’s Facebook fan numbers. Perhaps it’s all of the ad agencies working on their Super Bowl ads. Many brands were pushing their vehicle sites and a couple of German companies were focusing on their USA Fan pages, instead of their global brand pages. 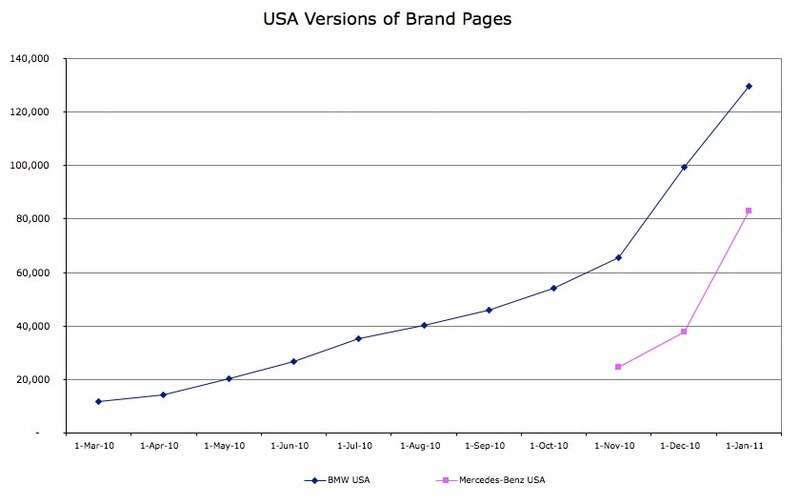 Both Mercedes-Benz and BMW created USA focused brand pages in 2010 (see the USA pages growth in the image below to the left.) Mercedes just completed a “Tweet Race” contest between 4 teams spending all kinds of money on celebrities, charities, providing luxury vehicles, and all congregating this weekend at the Super Bowl in Dallas, Texas. 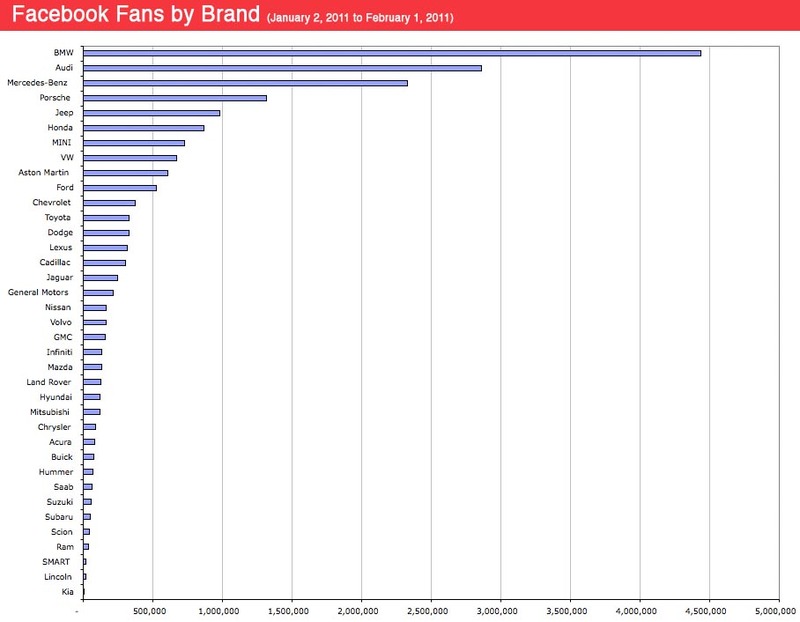 Even though it was a “Tweet” contest, Mercedes spent quite a bit on advertising the event on Facebook throughout most of January. BMW ran several advertisements promoting the new X3 and the all-new 1M. The X3 Matchup was promoted in January ads on Facebook to promote their coming Super Bowl ad. Players match different images and watch for clues in the Super Bowl ad to win a X3 for 2 years and a VIP trip to their Spartanburg plant, museum, and most importantly their Performance Driving School. Facebook fans are asked to build a X3 where they try to guess the exact build of the one appearing in their Super Bowl ad. I’m guessing silver. 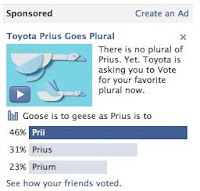 Toyota heavily promoted their name the “Prius Goes Plural” campaign after the brand launched several new Prii, Prius, Prium vehicles at the Detroit Auto Show in early January. It seemed as if every day Toyota had the reachblock bought on my Facebook’s Home screen. With all of their promotion, only one of my Facebook friends voted and I have a ton of friends who are car nuts and in the industry (661 friends total.) Sure my checking my friends against people participating is far from scientific, but it did surprise me when the typical auto ad on Facebook has at least 3 or 4 of my friends liking it. Voting of course is different. An important note on Toyota’s Prius campaign, it didn’t drive fans to the brand’s Facebook page; hence, the measly 2% growth rate for them in January. Fortunately, Toyota has a pretty strong presence with their Prius brand and many in the industry wonder if they’ll ever move Prius off to its own brand. Perhaps with so many new models that scenario may be playing out. Finally, the strongest growth came from Acura. They recently abandoned their separate vehicle pages so now whenever they have a vehicle promotion they drive traffic to their brand page. In January, they ran a promotion to their “Compete Like A Pro” contest for the all-new TSX Sport Wagon. What’s great here is that they grew their overall fans instead of just a single vehicle fan page so they can promote other products to those fans. 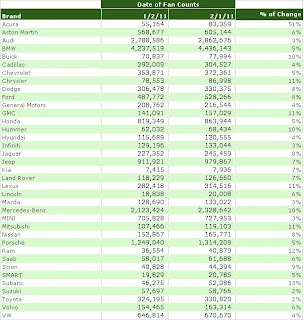 It was a smart move for Acura and their growth in January shows how it helps the overall brand presence. I am pretty shocked at the over low numbers. Is it because only a few brands bring out passion? 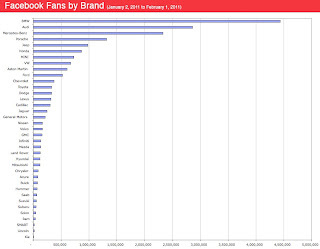 I am a fan of quite a few Brand pages not because I am a fan, but because I want to observe what they do on Facebook. And interestingly for a bit the only page I 'Liked' was the fiesta to see the Fiesta Movement. But 'Unliked' the page awhile back. Maybe its because Auto is such a massive advertising sector combined with the greatest presence in our daily lives seeing cars everywhere, which has us less likely to 'Like' a car brand on Facebook? BMW is the best and most popular brand followed by Mercedes and Audi and i am sure this brand will rock in facbook also in 2011 as well as it did in 2010. 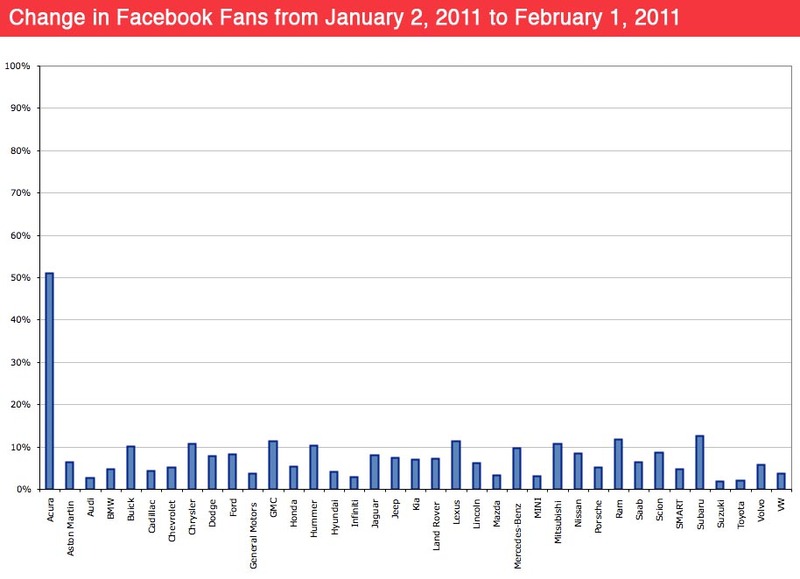 The kings of Facebook today are the Ford Mustang and the germany automakers.